The author tells us that, as with dogs, humans have a long association with horses, that has made us develop a critical eye for lines and proportions, with a purely aesthetic purpose. 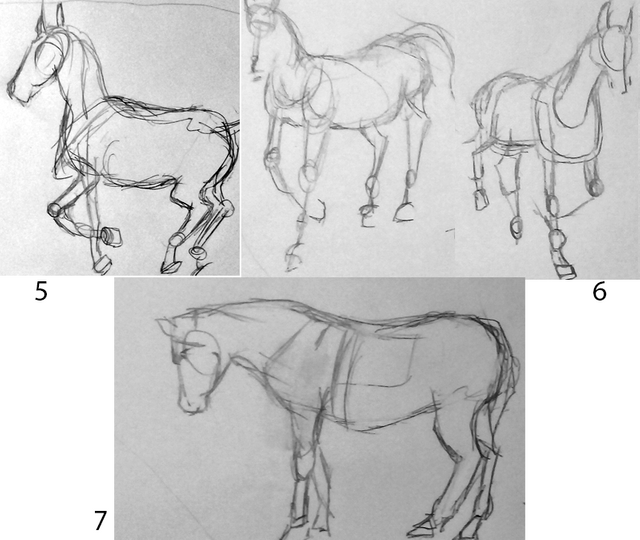 It is especially unsatisfactory to see a painting or drawing of a horse and notice basic anatomical or proportional errors. 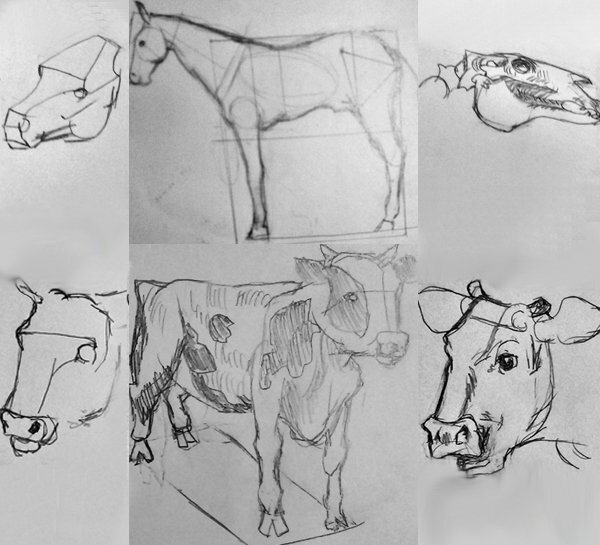 With the horses, the drawing of the head if it is not perfect, shows that it is of a different race or of poor breeding. He emphasizes that the most important thing is to analyze the model, not to simply copy it. 1 Vilppu shows a system of measurement for the correct proportions of a horse. 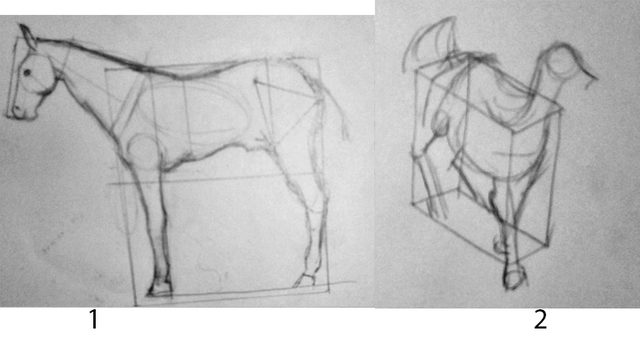 As in other tutorials where the human head was used as a unit of measurement, here we will use horse's. He points out that the length of the torso is almost comparable to the height of the shoulders, creating a square. 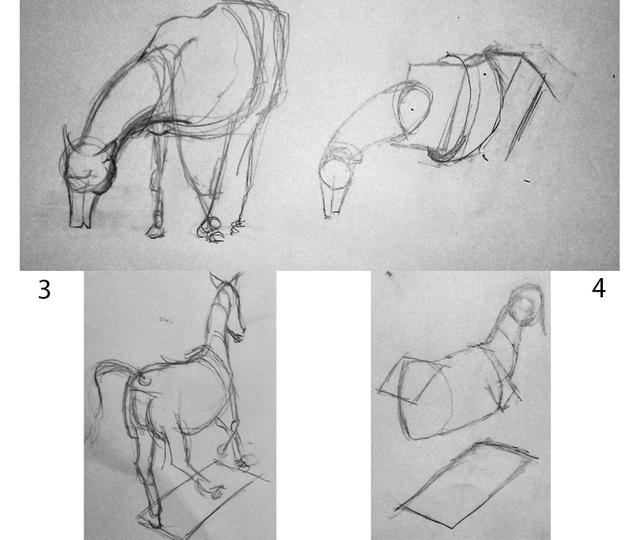 2 We can begin to explore the proportions of the horse in perspective. 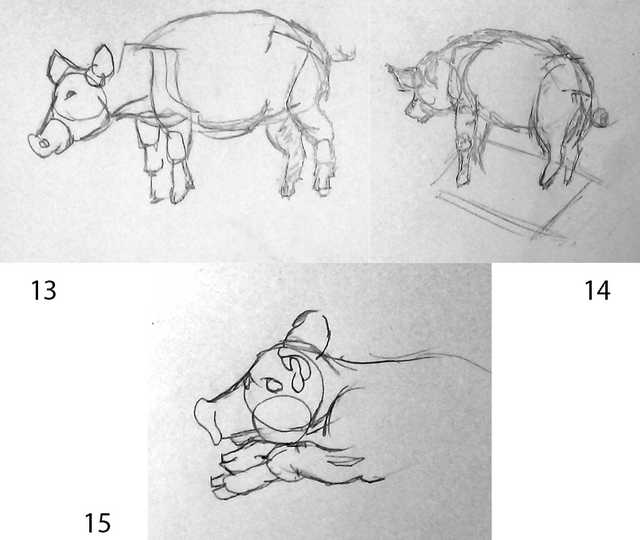 3 and 4 Now we must move on to the process we developed for cats and dogs, adapting the anatomy to forms that are more familiar to us. We return to the procedure of starting from the general (5), adding volume (6) until we reach the specific (7). 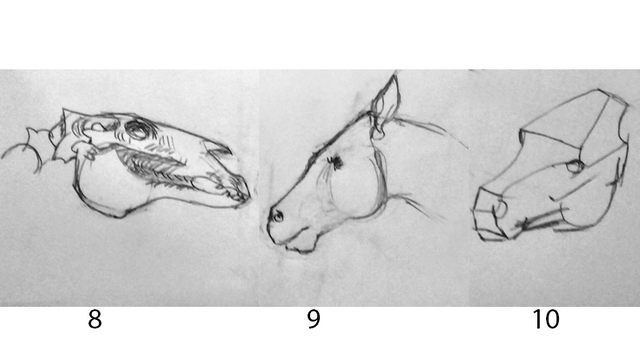 We will analyze in detail the head of the horse. 10 Vilppu proposes us to look at the corners, visualize the form as a series of simple planes. 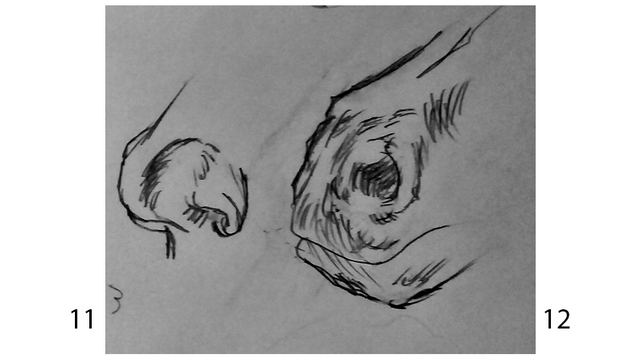 A comparison of the human nose (11) with the horse (12), which are not as different as we would think. 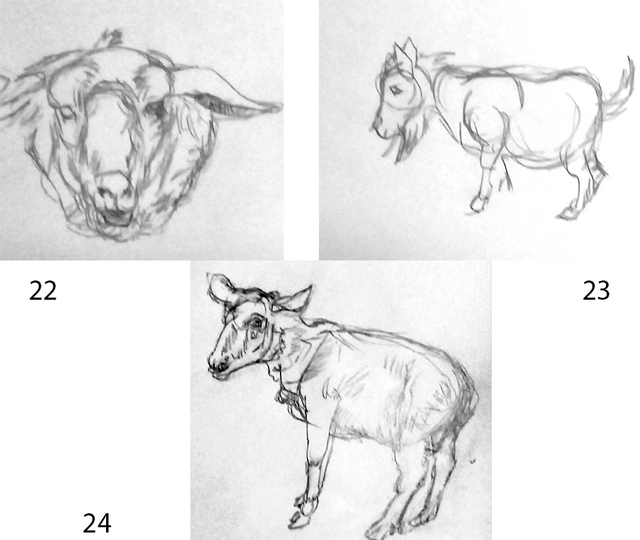 Applying the knowledge we have, we can replicate the procedure for other farm animals. 13 We begin by transforming anatomy into known forms. 14 Then place it in perspective. 16 Vilppu analyzes the hoof. 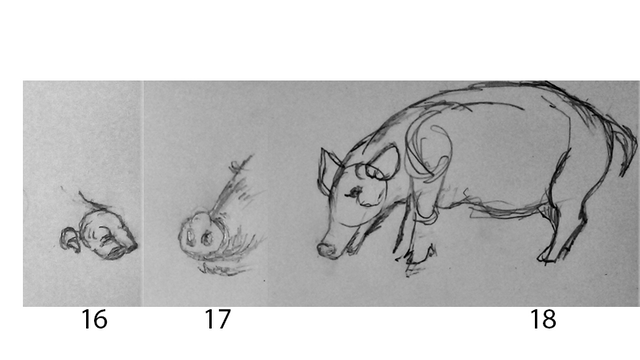 17 The snout. 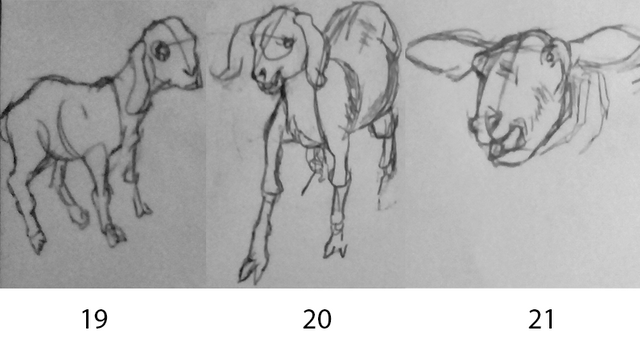 19 and 20 We can start the head of the goat with a cross. 21 In the case of the sheep, the cross has to be curved by the alignment of the eyes. 25 We repeat the process of the cross, 26, adding the shape of the cylinder for the horns. 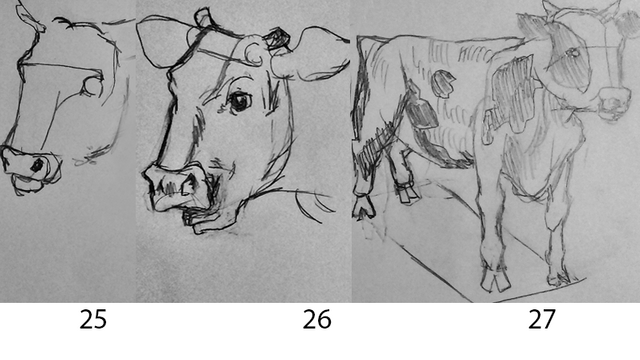 27 The cow, in perspective. 29 The cow's eye in detail. These are the main species of farm animals, with the exception of birds, we'll analyze them in the next part along including some more exotic animals. Thank you, Spidey! I really enjoy making it. I like that you found your niche. 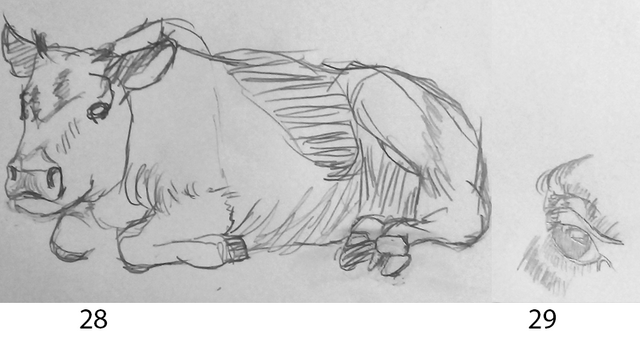 I haven't seen anyone else posting about drawing animals. Your tutorials are so well written and detailed. Very easy to understand. Thank you for sharing! Thank you so much! I really enjoy doing it, It's like a buffer for me when I'm not inspired or don't have materials to make a painting. Congratulations! This post has been upvoted from the communal account, @minnowsupport, by siucatti from the Minnow Support Project. It's a witness project run by aggroed, ausbitbank, teamsteem, someguy123, neoxian, followbtcnews, and netuoso. The goal is to help Steemit grow by supporting Minnows. Please find us at the Peace, Abundance, and Liberty Network (PALnet) Discord Channel. It's a completely public and open space to all members of the Steemit community who voluntarily choose to be there. Thank you, @melooo182 for the suggestion, I'll add it now. Your UA account score is currently 2.575 which ranks you at #15069 across all Steem accounts. Your rank has improved 125 places in the last three days (old rank 15194). In our last Algorithmic Curation Round, consisting of 490 contributions, your post is ranked at #260. You got a 10.98% upvote from @ocdb courtesy of @siucatti! Thanks, guys! I really appreciate it. Repollo es un proyecto que tiene como misión entregar recompensas a todos los creadores de contenido. Gracias por mantener tu membresía activa. @cervantes apoya a Repollo, Puedes votar por ellos como Witness aquí. No te olvides de seguir promocionando tus publicaciones en nuestro Discord. Bienvenido a Repollo Curaciones.